Here is another easy recipe with no cooking required, just a little extra arm effort is required when mixing the ingredients together. Mix the icing sugar and condensed milk together. Mix in the coconut, the mixture will be very stiff. Add a tiny amount of food colouring (I used pink) to one half of the mixture, and mix until you have an even colour and muscles in your arm! Line a tray or sandwich box, and spread the mixture out, press down firmly. Where the two colours connect make sure you push them together well. I would suggest you leave the tin in the fridge for at least 5 hours, to make sure they are firmly set. I removed mine in one slab from the tin and then used a large knife to cut into dominoes shapes. Eat or gift wrap. These will keep for 3 weeks in an airtight container in the fridge. It's great isn't it? A bit to easy to have another bit and another bit. You must have a look at my wee Cooper making coconut ice. The look of concentration on his face will make you smile. I could have made it so much quicker on my own. Thank you for the recipe which looks so easy! I'd definitely like to try this. My parents love this. I might have a go, thanks for sharing! I used to make this as a child, Id forgotten all about it! Great for making with the kids. 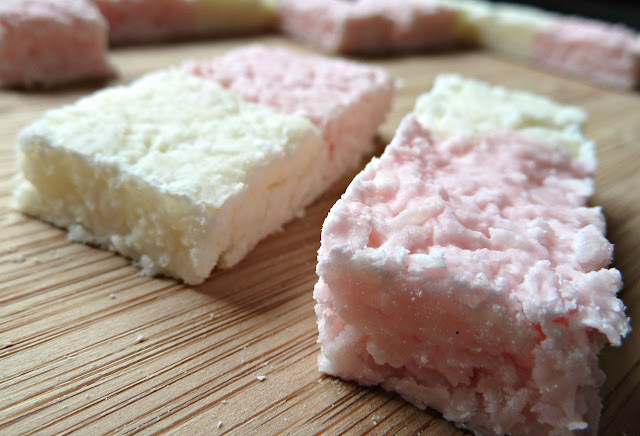 I'm quite obsessed with coconut ice, such a nostalgic and comforting treat! Must give this a go at some point.